This is a marvelous arowana which is displayed in Seoul Coex Aquarium. It seems that Koreans also like to keep arowana as an aquarium fish. Arowana has become a favorite pet fish for fish lovers. The whole body of arowana flickers golden light. 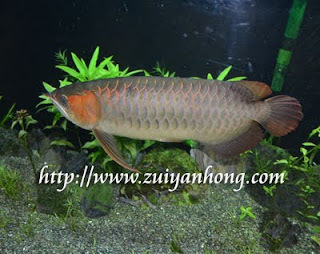 It is said that arowana has the effect of eliminating disasters. Beyond that, the owner of the arowana will auspicious and prosperous. Ornamental fish lovers who are believe in fengshui one after another go after arowana rush. That's why arowana is sold like a hot cake. Food: frogs, shrimps, crickets, small fish, mealworms and cockroaches.